Travels with a Tin Donkey: First Century of the Season: on to Fitzroy Harbour! A Website dedicated to cycletouring, racing and other good things two-wheeled. First Century of the Season: on to Fitzroy Harbour! It was another beautiful day in Ottawa, and I left home at 8:20 am to get to the Billings Bridge Plaza for the start of another Ottawa Bicycle Club group ride. On Beechwood I saw the runners doing the Ottawa Marathon. They all looked pretty fresh, but then the weather was superb and they were only at the 15 km mark. I, on the other hand, would do my exercise sitting down. There was another big mob at the Plaza and we quickly divided into groups and headed off. On the menu: 58 kms roundtrip to Kanata, or 94 roundtrip to Carp or (and most people did this) 140 km roundtrip to Fitzroy Harbour. I had never been to Fitzroy Harbour but it just sounded so nice and Victorian, perched there on the Ottawa River. After the usual boring ride through the endless Ottawa suburbs, our group eventually found its paceline rhythm under the leadership of Perry, the Man with the Map. We worked well together into a headwind and soon reached Carp. We found ourselves on empty country roads, some in better condition than others and before I knew it we had reached Fitzroy Harbour, which, frankly, is not much to look at, even though it was founded in 1831. We stopped at the general store there and several in the group had fresh pizza. I prefer to eat dull energy foods and save my appetite for when I can get home and relax. We cruised up a biggish hill out of town and on the ride home we had a nice tailwind, or at least a reasonable sidewind. The sun was shining, we did not get lost once (well perhaps a little at one point) and nobody had a flat tire. Since it is 9 km to Billings Bridge from my house, I needed to add a few more miles to bring the ride up to a full Century. Andre and I rode along the bike path beside the Rideau River, which was a lot more crowded than when I had gone in the opposite direction in the morning, and then rode along the Rockcliffe Parkway. On the last stretch to the Rockcliffe Airport we rode on the bike lane and someone not paying attention almost rode his bicycle across the yellow line into us. It would have been ironic after a full day on the bike to be knocked down near my house! Altogether I put in 163 km which, coupled with yesterday's ride, made a pretty full weekend. But I am still envious of my friends in Virginia who are riding the wonderful Mountains of Misery near Blacksburg today. Fat Cyclist: not really fat, but fun. Eisenherz-Bikes: Life is too short to ride an uncool bike. Klassikerausfahrt: THE retro ride in the Dusseldorf area, currywurst included! Lovely Bicycle! is a blog written by a woman, emphasizing classics and the handmade. Nice design. Masini's Breaking Away Blog: Rory Mason is Cannondale's Man in Italy but loves the oldies. 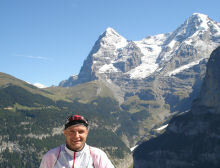 SpeedBicycles in Switzerland: Stefan has some great stuff! Cino Heroica: one of the few US retro rides, this one is held over two days in September in Montana, of all places. The Retro Ronde: Ride with the Flahutes of Flanders! Augustin Reisen: a bus, some hotels, great mountains and even better experiences! Club des Cingles: climb Mt. Ventoux 3 times in one day and you get a certificate! Cycling in Münsterland: the best-planned cycling infrastructure anywhere? Bruce Doscher does great Tour de France posters each day of the race! Edition.Hympendahl offer fine art prints and the book "Beyond the Finish Line"
Rouleur: probably the most stylish magazine on bike racing. Ever. Food Links: Because You Need Fuel to Ride! The Blair Hill Project, or Yet More Intervals! Interval Training Can Be Fun!